CDC25C antibody recognizes M-phase inducer phosphatase 3, also known as dual specificity phosphatase CDC25C, mitosis inducer CDC25, phosphotyrosine phosphatase, protein phosphatase 1 or regulatory subunit 60. This antibody has been extensively validated for western blotting using whole cell lysates. Mouse anti Human Cdc25C antibody recognizes the M-phase inducer phosphatase 3, also known as M-phase inducer phosphatase 3, dual specificity phosphatase Cdc25C, mitosis inducer CDC25, phosphotyrosine phosphatase, protein phosphatase 1 and regulatory subunit 60. The CDC25C gene is highly conserved during evolution and it plays a key role in the regulation of cell division. The encoded protein is a tyrosine phosphatase and belongs to the Cdc25 phosphatase family. It directs dephosphorylation of cyclin B-bound CDC2 and triggers entry into mitosis. It is also thought to suppress p53-induced growth arrest. Multiple alternatively spliced transcript variants of CDC25C have been described, however, the full-length nature of many of them is not known (provided by RefSeq, Jul 2008). 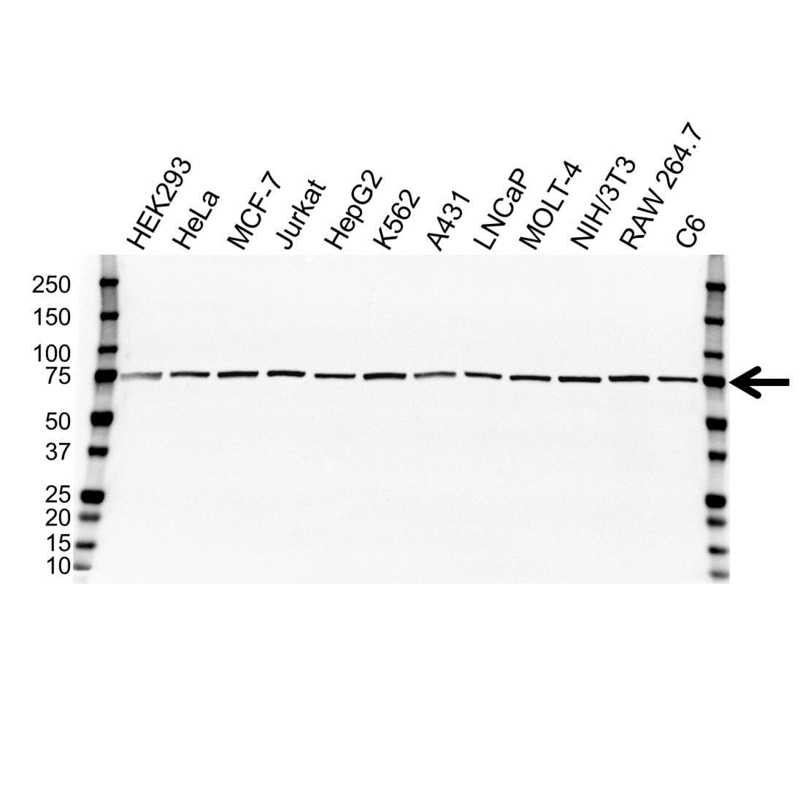 Mouse anti Human Cdc25C antibody detects a band of 75 kDa. The antibody has been extensively validated for western blotting using whole cell lysates.